If you are looking for training in First Aid, we can help. We run courses covering emergency first aid at work, basic life support training and first aid for children amongst others. Employers have an obligation under the health and safety (first aid) regulations 1981 to make adequate and appropriate provision for their workforce. Help! First Aid Training courses are designed to give your staff the essential skills they need, and the confidence required to provide effective first aid. All of our courses meet and exceed the current (UK) Resuscitation Council guidelines and are HSE compliant. 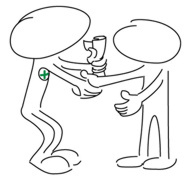 Our First Aid Training Courses cost approximately 30% less than Red Cross and St. John. People who attend our training courses gain their skills and confidence in a relaxed instructional atmosphere from a hands-on practical and light-hearted approach. Our trainers work with the students to ensure that they are fully confident and competent in their first aid skills. They have a wealth of experience and expertise, which ensures your staff receive the most effective training available. Help! First Aid Training also offer a comprehensive range of first aid products, so we can act as a one-stop shop for all your requirements. "Hathaway's are committed to providing excellent first aid facilities including equipment and professional training for our trainees. Our training has been provided by Dave Thompson for a number of years. We currently have a total of 21 first aid trainees, of which 13 hold first aid at work. In addition, Dave has trained our Factory and Office first aid trainees in the use of automated external defibrillation and airway management and oxygen therapy. We have found Dave is very knowledgeable and a skilled presenter."